Odax (SS-484) was laid down by Portsmouth Navy Yard 4 December 1944; launched 10 April 1945; sponsored by Mrs. John E. Fogarty; and commissioned 11 July 1945, Comdr. F. D. Walker, Jr. in command. After shakedown off Portsmouth, Odax got underway 19 September 1945 for Guantanamo Bay to provide services to the Fleet Training Group. On 30 October she sailed to Key West, Fla. for duty with the Fleet Sonar School and conducted operational training until September 1946. 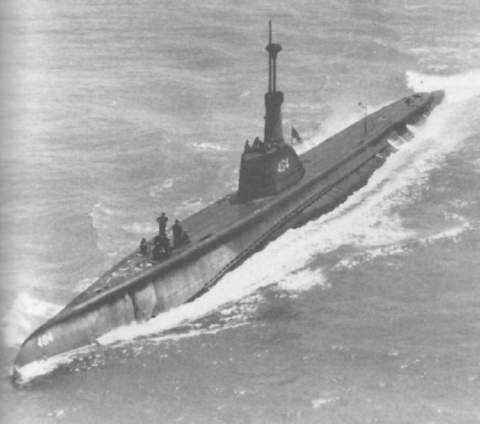 In September 1946, as part of the Bureau of Ships post-war investigation of the high speed submarine, Odax was selected for conversion to a Guppy and returned to Portsmouth. Completing conversion in August 1947, first of the Guppy submarines, she sailed to Key West for extensive research development work. In August 1951 Odax again sailed to Portsmouth for conversion. The major aspect was the addition of a Snorkel and redesignation as a Guppy II. She first put her snorkel to tactical use in a large scale convoy exercise in the spring of 1952. In September 1958, Odax deployed to the Mediterranean for a tour with the 6th Fleet. During this deployment she transited the Suez Canal to participate in a Baghdad Pact exercise in the Arabian Sea. After her return home, Odax changed home port transferring to Charleston, S.C. in August 1959. She sailed from here early in 1960 to return to the North Atlantic for Barrier Patrol. Odax departed Glasgow, Scotland in August 1960 for South America to conduct exercises with naval units of various South American countries. In December she returned to Charleston to resume local operations. In August 1964 she deployed again to South America to participate in combined operations while circumnavigating the continent, returning in December. From 1965 to 1967 she operated out of Charleston. In May 1967 Odax began a deployment in Northern Europe. Upon her return to Charleston she was awarded the coveted Battle Efficiency E for Fiscal Year 1967. She resumed coastal operations in October 1967 and continues this into 1970.